TekSupply is the world's leading barn curtain manufacturer! Barn curtain provides natural ventilation in summer months as well as essential protection from harsh winter weather for valuable crops and livestock. Curtain systems use little, if any electric power, making them a green option for ventilation. 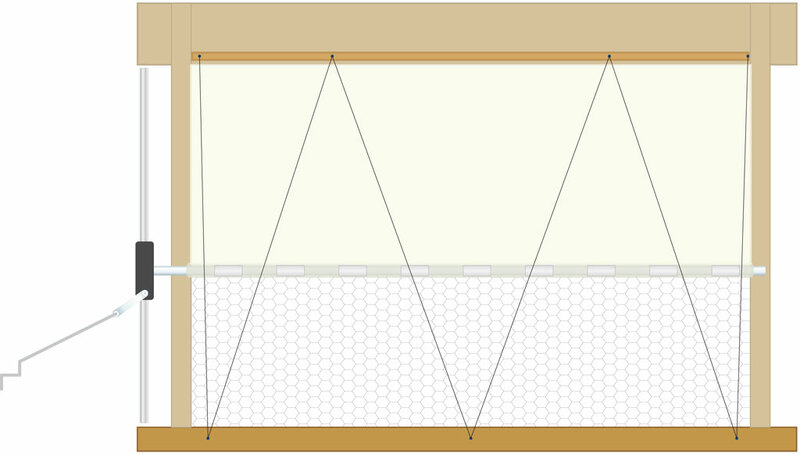 Planning on purchasing roll-up or drop-down curtain to install in your barn or livestock building? This helpful guide can assist with designing a system to meet your needs. 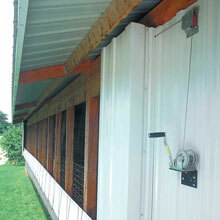 The two most commonly used barn curtain configurations are Drop-Down and Roll-Up systems. The first step in setting up your barn curtain is to choose a curtain material. Material is available in a variety of weights and styles including PolyMax, VinylTek and other specialty materials. The width of the curtain should be large enough to cover the opening plus an additional six inches for attaching to the barn. The length should be two feet longer than the opening to engage the curtain pockets. If you are planning to make your own curtain pockets out of fabric, make sure to include an additional six feet of length per curtain. Our barn curtains come standard with a small hem which accommodates up to 0.922" OD swaged pipe. Medium, large and keder hems are also available. 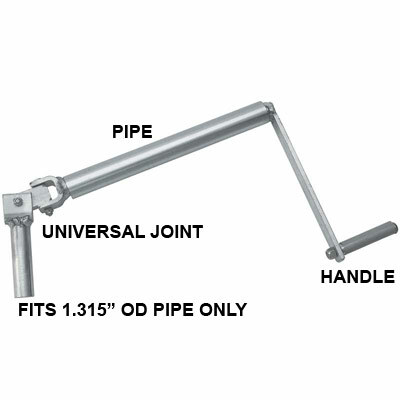 Medium hems accommodate up to 1.66" OD pipe and large hems accommodate up to 1.90" OD pipe. We suggest large hems or keder hems for roll-up curtain applications. 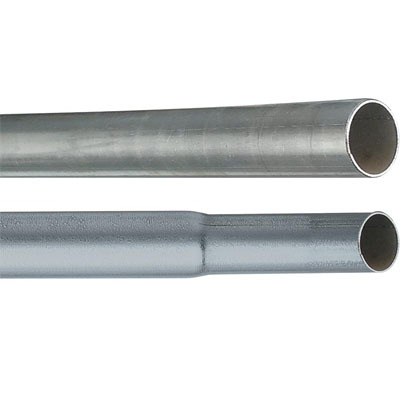 For a perfect barn curtain installation, we recommend our swaged curtain conduit. PolyMax 5.2 oz. 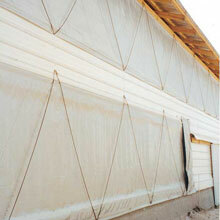 Clear Barn Curtain is stronger than any other poultry house curtains and features added UV inhibitors. This curtain will not tear or rot and has superior cold crack resistance. PolyMax 7.5 oz. Super Premium Curtain is an excellent choice for hog and dairy housing. This curtain is available in Clear, Silver/White or White. PolyMax Premium 6 oz. 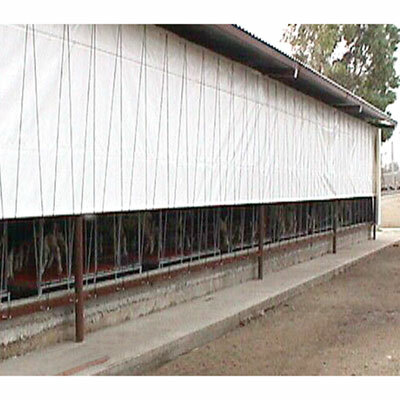 Curtain is specially formulated for broiler houses and will prevent light penetration more completely than any other poultry house curtain. It is available in Black/White or Black/Silver. To achieve total darkness we recommend using PolyMax Ultra Blackout Barn Curtain which combines two 6 oz. layers for a total weight of 12 oz. This curtain is offered in Black/Black or Black/Black/White. PolyMax 10 oz. Ultra Curtain is an ideal roll-up curtain and is available in both White and Clear. The White style is available with our Premium Glider and Premium Tube Roll-Up Support Systems. Our best roll-up curtain is the PolyMax 12.5 oz. Poly Curtain which comes in White, Green, Tan or Grey. The 12.5 oz. Poly Curtain is available with a large hem only. VinylTek 16 oz. Super Clear Curtain has a "see through" effect which lets the sun shine in, providing a nourishing environment for your livestock that will help promote faster weight gain and conserve your energy costs. This curtain is available in Clear, White or Super Clear. The Super Clear style lets in the maximum amount of light. Our very best 22 oz. PVC-Coated Vinyl Curtain is constructed from 22 x 20 1,000 denier woven vinyl that withstands a temperature range of -22° to 158°F and is flame resistant. This curtain is available in Tan or White. Insulated curtain comes in both standard and quilted styles. 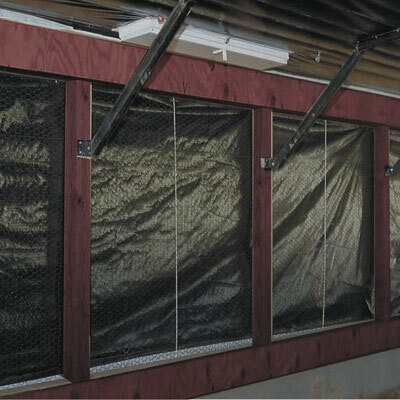 This type of curtain helps to reduce heating costs in livestock buildings, especially in extremely cold climates and on the north side of buildings. Insulated curtain with 12" clear PVC strips is also available to allow daylight in while the curtain is closed. This feature reduces lighting costs while keeping the cold out. Our quilted insulated blackout curtain is an ideal choice for poultry and livestock housed in standard and tunnel vented barns. 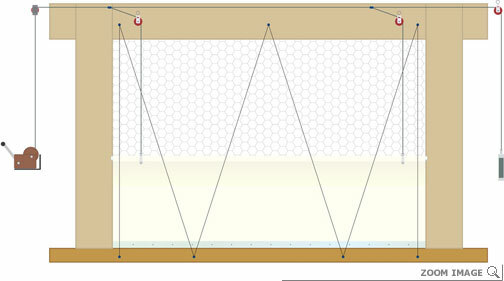 The drop-down method means that the curtain will "drop down" to allow for ventilation of housing. 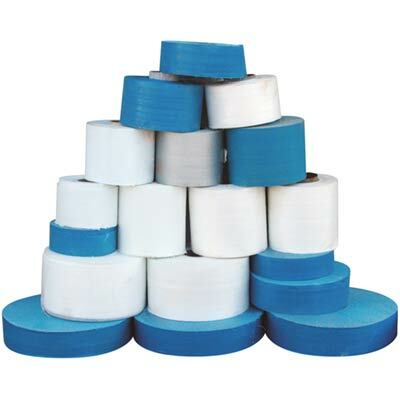 It is commonly used in calf barns, poultry barns, lambing sheds and greenhouses. This simple, easy and effective system controls the air entering your building providing ventilation to the barn without exposing your animals to drafts. 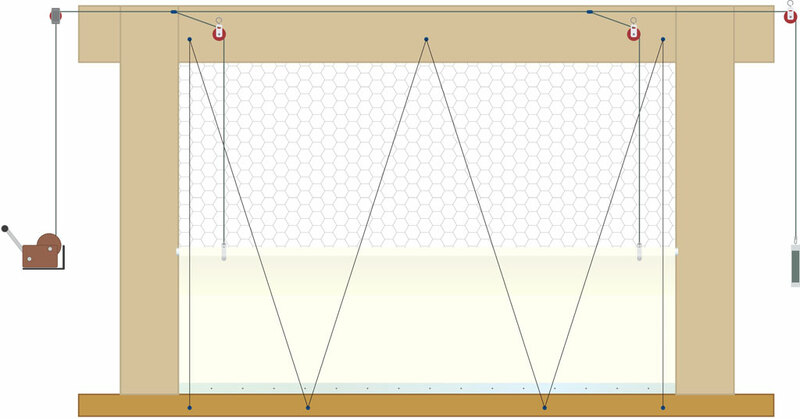 Instead, the incoming air is above the animals and mixes with the warmer air closer to the ceiling. A drop-down curtain configuration requires a winch and pulley system that uses various pieces of hardware to construct. 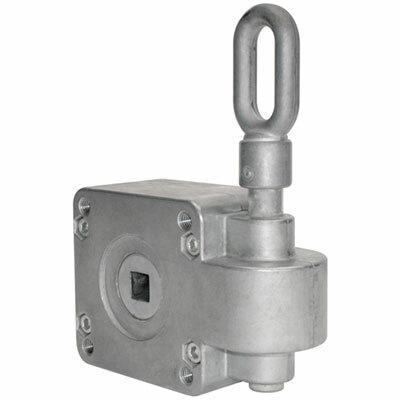 A manual hand winch with a winch mounting bracket is used to raise and lower the curtain. The cable is connected to the winch and travels up the side of the building. It threads into a pulley on each corner of the opening and then travels back down the other side of the opening where it connects to the counterweight. The counterweight keeps tension on the cable. It is tied off with one cable thimble and two cable clamps which are attached with open eye hooks. The recommended cable is 1/8" (or 3/16" for larger openings with heavier weight curtains) in diameter and 7 x 19 for strength and flexibility. The length of cable required is equal to the length of your curtain plus four curtain widths (height). An additional pulley may be required for curtain widths over four feet in width on which to hang the counterweight. The counterweight needs to be at least two curtain widths from the corner pulley to be able to open your curtain fully. Fastening Strips are used to secure the top of the curtain to the barn. Insert the conduit within the hem located at the lower edge of the curtain. One end of each 8' or 10' long rod is swaged or 2.5" that result in strong, overlapping connections. You may need to order one additional rod to compensate for the number of crimped connections. Fabric Clips are placed over the inserted conduit every three to four feet to prevent the conduit from spinning within the hem. Drop assemblies are recommended every five feet depending on the length and width of the curtain, as well as the weight of the curtain material selected. Each drop assembly consists of one curtain pulley that is installed with an open eye screw hook and one adjustable plastic thumb nut, Sta-Kon or cable clamp. The polyester drop cord is attached to the top and of the curtain clamp and is then threaded through a curtain pulley and finally attached to the cable with a thumb nut, Sta-Kon or cable clamp. The length of the drop cord required is equivalent to the width of the curtain times the length of the curtain divided by 5'. These drop assemblies need to be adjusted regularly to keep the conduit hanging evenly for best performance. The distance between the corner pulley and the first thumb nut, Sta-Kon or cable clamp needs to be twice the width of the curtain to ensure the curtain can be opened all of the way. The 3/16" diameter Poly Rope is used on the exterior of the installation to prevent the billowing of the curtain. The rope is woven in a zigzag pattern through closed eye hooks that are spaced every two feet. The rope should be pulled firmly and tied. After installation, regular maintenance is required to keep this tight. At the bottom of the opening, curtain brackets are used to keep the rope from interfering with the curtain when the curtain is open. Curtain pockets provide a channel for the curtain to slide in and prevent the ends from billowing or catching the wind. Bird netting is used to cover the opening to prevent birds from entering when the curtain is open. This also prevents the curtain from blowing inside the building. Use the poly netting or PVC-Coated Hex Wire and install with staples. Please keep in mind that this guide provides general information and that some measurements may vary. Ask your National Account Manager if you have any questions or require assistance with ordering barn curtain. 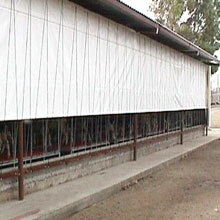 Roll-up curtain is commonly used in freestall barns, pack barns, high tunnels, greenhouses. It allows natural lighting and ventilation in barn structures. 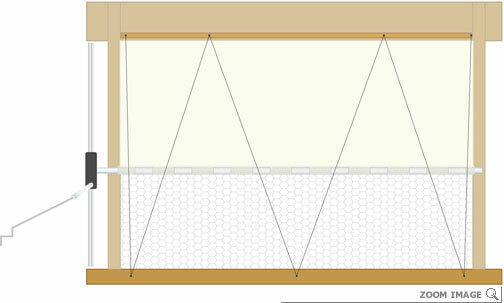 A roll-up curtain's configuration requires a conduit and crank system that uses various pieces of hardware to construct. It is recommended that wire mesh is used to prevent curtain from getting blown into the building during heavy winds and to keep the animals away from the curtain. Our manual roll-up curtain assembly offers fast, easy, controlled curtain roll-up for your precise ventilation needs. Just a "twist-of-the-wrist" or a turn of the drill is needed to roll up the curtain. The 15:1 gear box can roll up to a single 150' curtain from the end or two 75' curtains from the center. We also offer hand crank assemblies which allow for fast and easy curtain roll ups and can be installed on the side or ends of most buildings. Their longer lengths are ideal for high overhead doors. Design your own unique manual roll-up curtain assembly or work with one of our knowledgeable National Account Managers to create the best system for your application. Openings over 6' tall x 100' long should use our strongest curtain system. We offer the option of combining both drop-down and roll-up systems on the same curtain. This system is available in a manual or motorized version. The motorized version can be operated by a switch or thermostatically controlled. Our fastening system makes installation easier. Since we utilize our keder rope for both "hems" of the curtain, all you need to do is slide the curtain into the roll bar and the mounting channel. 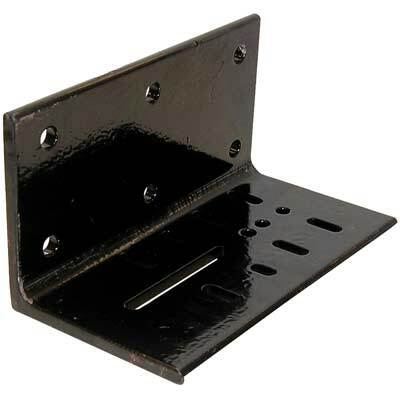 This reduces labor costs for installation and maintenance. The premium curtain roll-up system operates on our 40:1 gear box (either manual or motorized). It can roll up curtains up to 300' long. The gear box can roll up one or two curtains from the end, or two or four curtains if mounted in the center. This system can also operate the curtains in a roll up/drop down "glider" application, which allows you to lower just the top portion of the curtains either by manual hand winch or a thermostatically controlled curtain machine. With this system feature, you can mix fresh air into the building without having cold air blowing directly on your livestock. Have questions about Bar Curtains? Visit our Live Help page or Contact Us.